Republican Lock On Florida's Cuban-American Vote May Be Over : It's All Politics For those reading tea leaves from the presidential election, here's something else to digest from the swing state of Florida: There are signs that the long relationship between politically active Cuban-Americans and the Republican Party is beginning to fray. American and Cuban flags in the Little Havana neighborhood of Miami. For Republicans ruminating over why their party lost the presidential election, here's something else to digest from the swing state of Florida. Cuban-Americans — long a reliable Republican voting bloc — split almost evenly between Mitt Romney and President Obama, according to at least one group's exit polls. And that may explain why Obama won Florida and its 29 electoral votes. Perhaps more important, the trend away from overwhelming Republican support signals that the long relationship between Florida's politically active Cuban-Americans and the GOP is beginning to fray. Bendixen & Amandi International, a polling firm that works for Democrats, found in its exit polls that 52 percent of Cuban-American voters cast ballots for Romney, while 48 percent went for Obama. That would be by far the greatest percentage of Cuban-American support for a Democratic presidential candidate in decades. "To jump up into 48 percent all of a sudden puts a vote that historically was monolithically Republican in play," said Fernand Amandi, managing partner of Bendixen & Amandi, who noted that while Democrats have been steadily gaining among Cuban-Americans, in 2008, that translated into just 35 percent support for Obama. Other exit polls looking at the Cuban-American electorate had a somewhat higher level of Romney support, and there was some dispute about who won among the demographic on Nov. 6. But virtually all signs point to a trend away from a securely Republican voting bloc. Vice President George H.W. 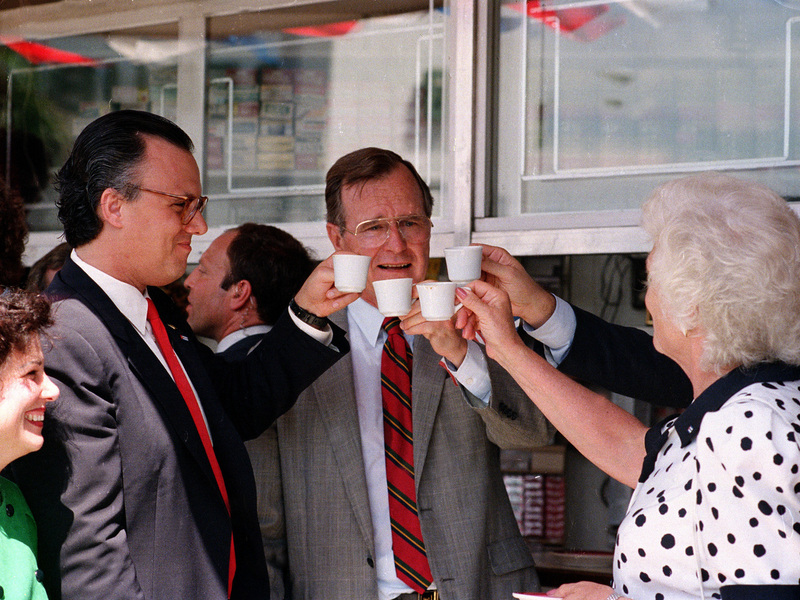 Bush toasts with cups of Cuban coffee on June 17, 1987, in the Little Havana neighborhood of Miami. Bush, who was in Florida to raise funds for his bid for the Republican presidential nomination, stopped at the restaurant after ceremonies renaming a street in the neighborhood for President Reagan. Amandi called his group's finding "a major development with implications, not just for Florida, but for the country." Bendixen had found support for Republican presidential candidates from Cuban-Americans in the state at 75 percent in 2000, 71 percent in 2004 and 65 percent in 2008. The relationship between Florida's Cuban community and Republican presidential candidates dates to the 1980 election of Ronald Reagan. For the past three decades, the Cuban-American Republican voting bloc in South Florida has helped offset the region's many Democrats. And Cuban-Americans have been the key to Republican presidential victories here. In the final week of this year's race, the Romney campaign mounted a Spanish-language TV ad in Miami in an effort to shore up its support among Cuban-Americans. It was anything but subtle. The ad showed Venezuelan President Hugo Chavez and the niece of Cuban leader Fidel Castro both saying they would vote for Obama. It was an attempt to push a well-used button in the Cuban-American community — linking an opponent with despised Venezuelan and Cuban dictators. This pro-Romney ad ran in the closing days of the campaign. ROMNEY: I'm Mitt Romney, and I approve this message. Democratic strategist Jeffrey Garcia finds it noteworthy that the ad had little impact. "I just think it's about a community in general becoming a little bit more Americanized," he said. Garcia and other analysts say exit polls confirm what's been evident for some time: that for Cuban-Americans, the future of their native land is no longer a major factor in determining whom they vote for. One reason is that there's little difference between the two parties on support for the trade embargo against Cuba and how they view U.S. relations with Cuba. 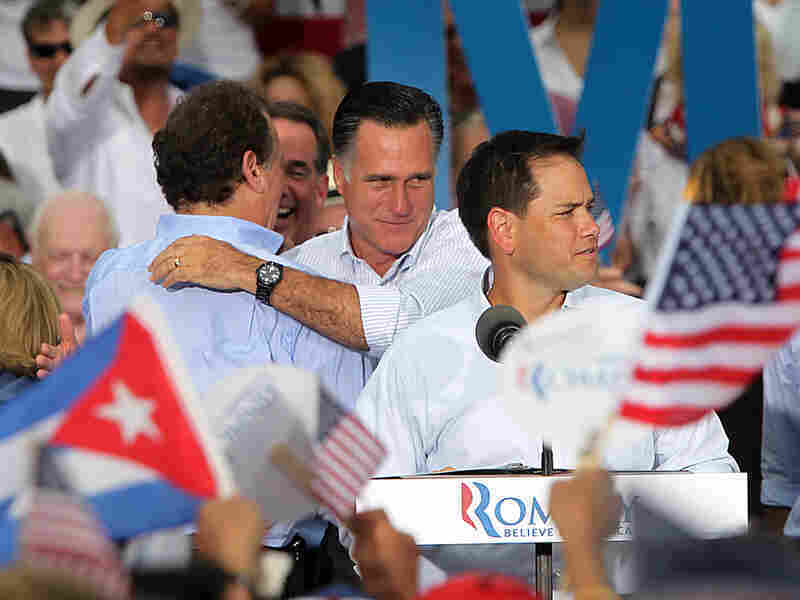 Florida Sen. Marco Rubio (foreground), a Cuban-American, introduces Republican presidential candidate Mitt Romney in Miami on Aug. 13 as Romney embraces former Florida Rep. Lincoln Diaz-Balart, who was born in Havana. 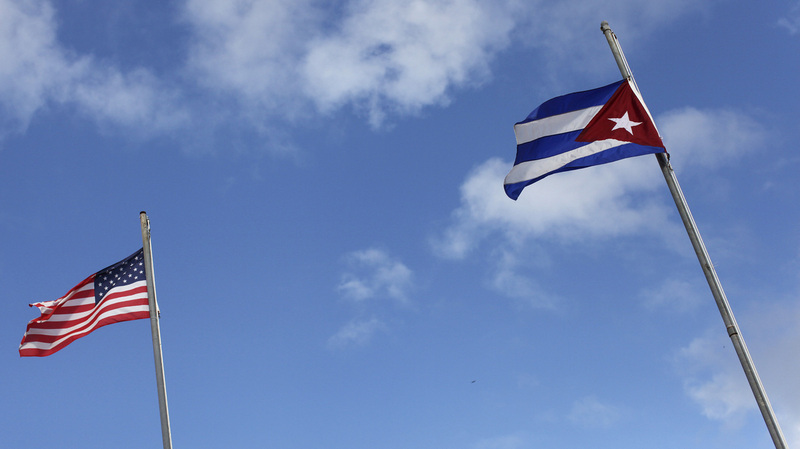 And more than 50 years after the Cuban revolution, many in the first wave of exiles have died. Second- and third-generation Cuban-Americans, and more recent newcomers, are more open to voting Democratic. But Dario Moreno, a political science professor at Florida International University and a strategist who works for Republican campaigns, says it's not just about demographics. He says Romney's message on immigration, the economy and the "47 percent" alienated many Latinos, including Cuban-Americans. Moreno also says that was true even in staunchly Republican areas such as Hialeah — a blue-collar Cuban-American enclave. "I think the Republican Party needs to reassess its rhetoric and some of its policies toward Latinos, beyond immigration to education and economic policies, without losing the core Republican message of lesser government," says Moreno. Cuban-American support is one of the reasons Miami-Dade County was one of the few in the country to produce more votes for Obama this election than in 2008. The president's margin in Miami-Dade was 70,000 votes higher than four years ago. That's about the same number of votes by which he carried Florida. Moreno and other analysts say this election shows Cuban-Americans, rather than being a sure thing for Republicans, have now become swing voters in Florida. That has implications for both parties as they begin to look ahead to future elections.